If your order weighs less than 13 ounces, save huge on shipping with USPS first class (with tracking number). This product weighs 5.3 oz. 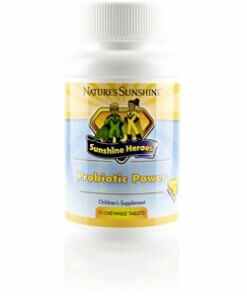 Nature’s Sunshine Sunshine Heroes Probiotic Power supports a healthy environment for friendly flora in a child’s digestive system. Probiotic microbes stimulate metabolism and nutrient absorption. The symbiotic relationship between probiotics and human hosts benefits both the probiotics and humans. Healthy levels of probiotics in children have been linked to better daycare attendance and lower risks of food allergies. Sunshine Heroes Probiotic Power comes in chewable capsules that contain 11 strains of probiotics, including Lactobacillus rhamnosus, Bifidobacterium bifidus, L. acidophilus, L. brevis, L. bulcaricus, L. plantarum, Streptococcus thermophilus, B. infantis, B. longum, L. casei and L. salivarius. A child may take one to two tablets a day. Tablets should be chewed thoroughly before swallowing.